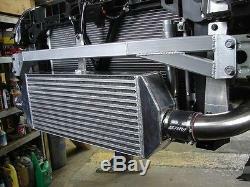 Brand new universal Intercooler Size: 31.00" (L) X 12.00" (H) X 3. 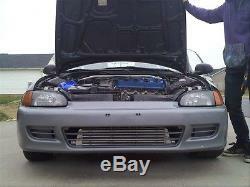 00(W) front mount intercooler. Made of high quality T6061 aluminum. High flow and light weight. Support up to 400HP and 35PSI. Compress air flow rate: 700cubic feet/min. Pressure drop: 0.2-0.5 at 15PSI, 2-5 at 35PSI. Full size: 31.00" (L) X 12.00" (H) X 3. 00(W) 3 Inch Inlet/Outlet. Core size: 23.50" (L) X 12.00" (H) X 3. Professional installation is highly recommended! Item exactly the same as picture shown. Depend on the size of the Package. Usually takes 24 48 hrs. Business time for the processing Saturday, Sunday and US Holiday does not Count! Handle : Usually takes 24 48 hrs. Business time for the processing Saturday, Sunday and US Holiday does not Count! Powered by Solid Commerce The All-in-One Listing, Inventory & Order Management Solution. 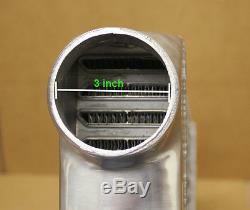 The item "UNIVERSAL TUBE & THIN ALUMINUM 3'IN TURBO 31'x12x3' FMIC FRONT MOUNT INTERCOOLER" is in sale since Tuesday, December 24, 2013. This item is in the category "eBay Motors\Parts & Accessories\Car & Truck Parts\Turbos, Nitrous, Superchargers\Turbo Chargers & Parts".